If miniature motorcycles have always been around, the Japanese marketing machine has gone furthest in creating mini-motorcycles that are as elaborate as full size machines. They have nothing in common with the molded plastic toy motorcycles with electric engines that blossom on the sidewalks at Christmas time. What we have here is a proper two-stroke motorcycle that can carry an adult, though it cannot be ridden on the public highway. These mini-cycles do not conform with construction and use regulations, even though the QR50 costs the equivalent of $1250. In 1971, Honda created the QA50, which was 50 inches long and weighed 115 lb. Over the years, this model evolved and eventually gave way in 1982 to the lighter and more compact Type QR, which only weighed 77 lb. 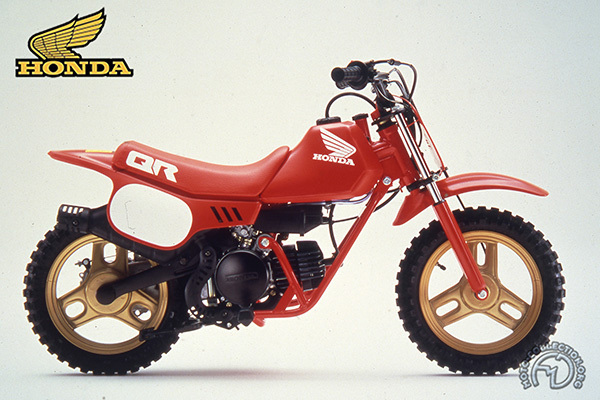 In 1984, the French highway safety authority, Prevention Routière, the National Gendarmerie and Honda-France decided to create a nationwide training scheme for children of four to eight years of age riding QR50s. The scheme proved so successful that the three partners developed six regional tracks in 1987, a figure that rose to nine in 1992. In that year alone, 95,256 children were taught to ride a motorcycle. Many Honda QR50s were used in this operation, which was keenly appreciated by these young motorcyclists of the future. And besides, Honda had – unbelievably – sold over 11,000 QR50s in France by the end of 1992. The tiny scale of the OR50 is evident from the size of the six-year-old rider (inset) undergoing training on a reduced-power model at an amusement park.